Happy Popcorn Lover’s Day! What a wonderful holiday to be able to celebrate…who doesn’t love a good specialty popcorn? I honestly had no idea that such a “holiday” existed and it is such a new holiday at that! Apparently Bob Matthews of Rochester, NY created this special day on January 6th 2012 and it is his favorite snack. Well, Bob from Rochester, I salute you because this was a great day to create for us popcorn lovers! In a mug, microwave coconut oil and brown sugar for 2 minutes. Add marshmallows and microwave for 1 1/2 to 2 minutes. In a separate mug, melt chocolate in microwave for about 1 1/2 minutes. Microwave popcorn per instructions on package. Pour popcorn in bowl and pour caramel and chocolate mixture on top. Mix together to evenly distribute and sprinkle top with sea salt. 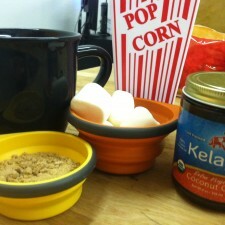 Heat coconut oil, marshmallows and brown sugar in a skillet on medium high heat. This will take a little while for the marshmallows to actually melt but it will form a smooth consistency. 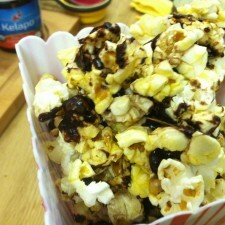 Melt your chocolate chips in a double boiler and drizzle on top of popcorn mixture as opposed to mixing into popcorn. Make sure to pop your popcorn after making the caramel and chocolate mixtures, this will ensure your popcorn is nice and fresh when it is coated. This is something that the kids will enjoy and you won’t feel guilty about eating ;). Pop in your favorite movie, mine is The Notebook (how original I know 😉 ), and kick back! Do you have a favorite kind of specialty popcorn? I did a quick calculation and this treat contains over 1800 calories! Even if you split a bag with someone (which contains just 4 cups of popcorn … so two cups each), that’s 900 calories per two cups of popcorn. I completely understand health benefits of coconut oil, but a 900 calorie snack is a bit excessive. Wowza. Thanks for the insights but with doing some research on the type of popcorn I used this treat would contain about 1500 calories. That does seem like a lot but I should have added in my recipe that I did not use the whole marshmallow mixture for my bag of popcorn! I had some mix left over that could have easily covered another bag of popcorn. So taken that into effect the calorie count would be about 800 calories per bag, divided by 4 (how many people ate my creation), and that is about 200 calories per person. I do apologize if I wasn’t as clear in my recipe that I should have been! Thanks! About how many cups of popcorn came out of the bag you popped? I would rather pop my own popcorn in …what else? Coconut oil, of course! But, I’m not sure how much to make. Looks delicious! I would say I popped about 10 cups of popcorn according to the packaging of the box that I used. Of course if you didn’t want that much you could divide that in half and then divide the recipe in half as well. Enjoy!